“It’s a bit messy I’m afraid,” says Glenn Ward the first time he leads me into the workshop. “We only moved in this week and I haven’t had time to set much up yet.” Inside, the space is filled by a trio of 1980s Porsches, sleek and clean but with their interior fittings almost entirely stripped out, while, upstairs, the customer seating area is in the starting stages of its development. The walls are cleverly lined with exposed wooden pallets and handmade shelving is stocked with sample strips of endless leathers and fabrics. Early days it may be, but the space already echoes what Awesome Auto Trimming are famous for – interior designs that are custom, handcrafted and entirely bespoke. Hardened campervan enthusiasts may well have heard of Awesome Auto Trimming before. The copy of Camper & Bus Magazine I thumb my way through on the train journey home describes the company as “one of the most talked about VW trim shops in the country”. 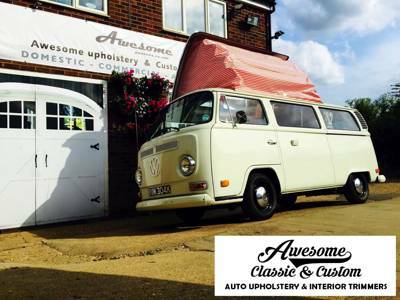 To the less initiated campervan fan, however, their workshop could easily go unnoticed, tucked as it is in rural Cambridgeshire with only a peppering of classic cars and VWs outside giving a clue to what they do. In fact, the current workshop is the culmination of several up-sizing moves by the company – run by Glenn and brother Greg since 1999. They first began in the garden shed of their parents’ home before moving to a town upholstery shop, where their focus was more on sofas and armchairs than classic split screen campers. Over the years, their natural enthusiasm for cars gradually led them back out of town, to a space where they could focus on bigger and better projects. “Sofas”, Greg smiles, “are pretty boring”. It’s vehicles that get their cylinders firing. “We’ve catered for a lot of campervans over the years”, says Glenn as he points out a VW T2 dashboard that’s mounted on a bracket in the workshop. “The custom dashboards are completely unique to us”, he explains, with the idea taken from the work they do on classic cars like the Porsches currently being worked on downstairs. “We were already doing it with the cars, so we thought we’d try it with VW campervans too”. It’s fast become one of the most common interior fittings they do. Being able to customise the dashboard may be an unusual request, but it’s symptomatic of the sort of minute details Awesome Auto Trimming are known for. As a clever custom item it ties in nicely with every other aspect of the vehicle, giving the whole thing one smart, continuous look. Over the years the projects have indeed been varied. There’s the tour bus interior they revamped for the Sugababes in 2004 – bright pink leather, of course – and the ginormous, 4x4 military fire engine they converted into a seven-seated ‘limousine’ in 2008. While for us humble camping fans the lengthy series of campervans they have dolled up over the years are all finished to eye-wateringly high standards. Pictures of a promotional campervan owned by Vodafone – a 1966 VW Splitscreen driven from festival to festival – were particularly jaw dropping. Think neon under-lighting, custom leather seats and a built-in television and sound area for fancy customer demonstrations. Then there’s the classic VW Samba I uncover plastered across the pages of Ultra VW magazine, “the attention to detail is superb… it all oozes pure quality”. Perhaps the most magnificent of all (and the most authentically camping) is the 1969 BMC Ambulance that appeared on the television show George Clark’s Amazing Spaces, entirely transformed inside by Glenn, Greg and their team. Sleeping up to six people on cleverly converting bunk beds and sleeping benches, the ambulance is a masterpiece of interior design with space cheated away in cubbyholes and secret storage spots. The diminutive van still has ample room for cooking, dining, living, while the retro textures and colours sit smartly with its vintage heritage. From a clapped out banger to fully-functioning family motorhome the overhaul takes your breath away. You can watch the full clip of Bertie the ambulance below – taken from George Clark's Amazing Spaces – or find out more about Awesome Auto Trimming on their website. Be warned, if you have your own campervan you’re sure to have your mind blown by some of the ideas!